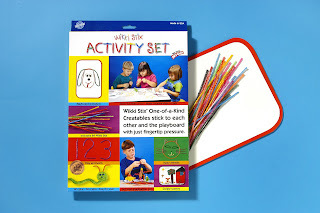 When we first opened the Wikki Stix Activity Set that we were sent to review, I don't know who was more excited, my 13 year old daughter or my 4 year old son... actually yes I do, it was definitely the 13 year old! 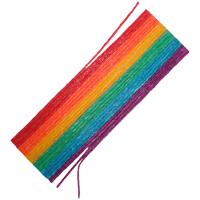 Liam took more time to get used to the idea of the Wikki Stix because they were a new tactile sensation for him, waxy like a crayon, but pliable like yarn... it would take a little getting used to. Luckily for me, Robyn was into them and was a great role model for what to do and how to play with the Wikki Stix. They started making circles and triangles, squares and more on the activity board provided. I love that this is a safe toy for Liam to play with and if he puts it in his mouth, all of the ingredients are food grade, and contain no gluten or nut oils! So far at our house they have been used and re-used and I am looking forward to being able to take them on our road trip in June, because they'll be great for in the car - both as a fidget for the kids and so that they can make something creative with them. They haven't been used for 3-D projects, but they have featured prominently in making shapes, random pictures and even letters and numbers! One of the things I love most is that, while the kids can share and use this together, Liam can also make thing on his own! And, best of all, as he grows, the breadth and scope of the projects he can use Wikki Stix for are almost endless... they are even great for use in his occupational therapy and at school! 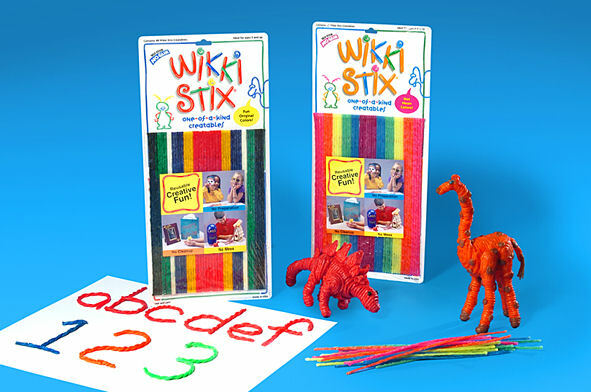 The Wikki Stix website has all kinds of great ideas for how to use their product - from creating 3-D shapes and figures to decorating Easter Eggs! You really should check them out! One of my favorite items in their collection is their party pack - which contains 15 packages with 12 Wikki Stix in each - great for treat bag gifts or, as Michelle, my Wikki Stix contact pointed out, great for keeping in your purse or the glove box of the car for quick and easy fidgets on the go! If you've gotten to the bottom of this review and haven't clicked on a link, why not? 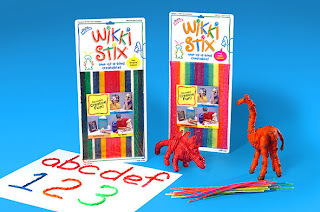 I still say that you need to visit www.wikkistix.com and check this product out for yourself!